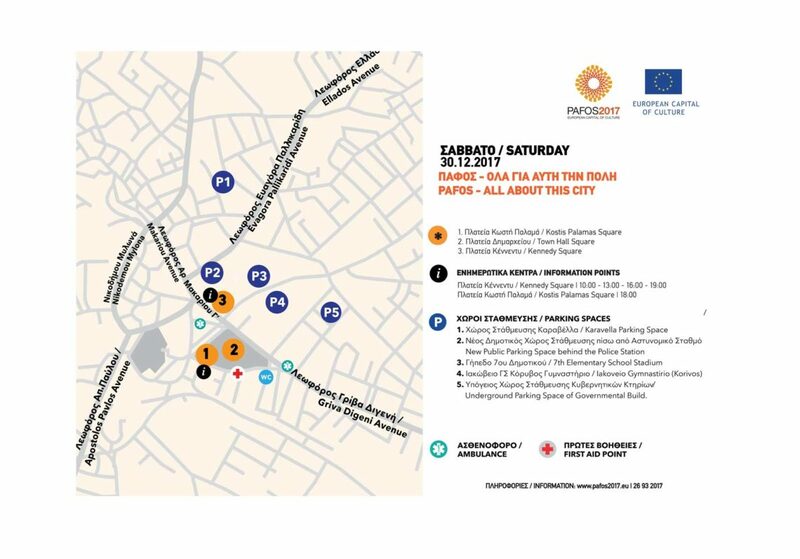 During the Closing Celebration Event of the European Capital of Culture Pafos2017 which will take place at the Pafos Town Hall Square on Saturday 30th of December 2017, the following public and private parking areas will be open to serve the public. Griva Digeni Avenue from the 1st Apriliou Street up until the Kennedy Square. Grigori Afxendiou will only be accessible for those using the parking areas to attend the event. Audience with disabilities are kindly requested to arrive early at the event. Our Volunteers will indicate the viewing point where they will be able to enjoy the event. We would like to let you know that the exhibition “Avlaia” at the Markideio Theatre as well as the exhibition “Weaving Europe” at the Attikon, will be open on Saturday from 10:00-13:00 & 16:00–19:00.